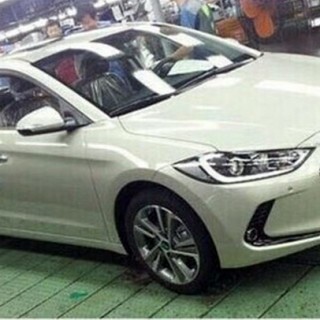 Hyundai said that the all-new Avante AD (Elantra in the US) would be arriving soon, and they weren’t kidding, as Korean websites are now running pictures of the new model without camo. The Avante AD is a Korean market model, and the images show that the new car will not differ very much from the US-spec Elantra. The sedan will make its US debut at the Los Angeles Auto Show in November, and will then make its way to showrooms during the first quarter of next year. The latest version of the Elantra comes with a number of design cues pulled from the Genesis luxury sedan, both inside and out. The style of the vehicle is more angular than ever before, making it a mature evolution. The official release date of the 2017 Hyundai Elantra 4-door sedan is just around the corner! Entering the 6th generation, the fully redesigned compact sedan will be launched at a local event in South Korea on September 6.! And it won’t take long before the 2017 Elantra hits the U.S. soil! According to latest automotive industry news, Hyundai Motor America plans to officially unveil the new generation Elantra sedan at the 2015 Los Angeles auto show. Make sure you come back here, as Hyundai blog will be covering the model’s inaugural U.S. market launch! 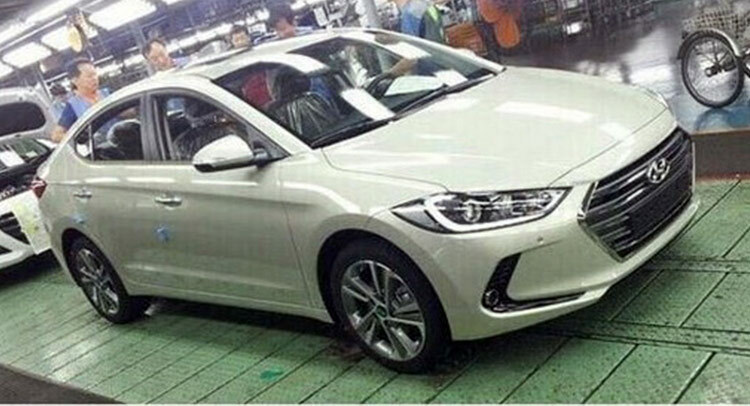 Now, let’s have a look at the latest Hyundai Elantra spy shots, which have been taken somewhere in South Korea. A couple of close up spy photos showcase a heavily camouflaged Elantra prototype. Coated in red exterior paint, the Elantra prototype sits on kind of small tires & wheels which may suggest that this ain’t the range-topping model. The fully loaded Elantra is expected to ride on 17- or perhaps even larger 18-inch alloy wheels. 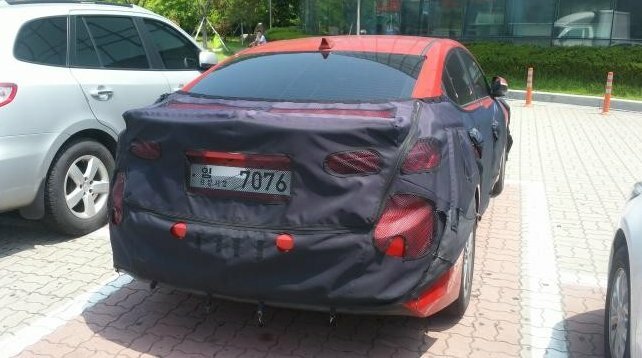 It is also evident from the spy pics here that the new Generation 2017 Elantra boasts Hyundai’s latest 2.0 Fluidic Sculpture styling. It appears that the overal vehicle shape (roof line) doesn’t differ much from the current generation Elantra sedan, however, you can expect major styling tweaks hiding under the black vinyl. Up front, you can expect the model to incorporate a whole new hexagonal grille, fully revised headlights and bumper, while at rear, the vehicle will feature restyled LED tail-lamps. Side profile will host a prominent side character line borrowed from the 2016 Hyundai Tucson crossover vehicle. Under the skin, there the 2017 Elantra will host a number of highly advanced powertrain technologies. The most interesting one is a combination of the 1,6L turbo charged engine and a 7-speed dual clutch transmission. Diesel engine will also be offered, however, the fuel-sipping 1,7L CRDI diesel unit will not be available in the United States.